Japanese Imported Automatic Movement; Manufactured by Miyota CO; 21 Jewels Escapement. 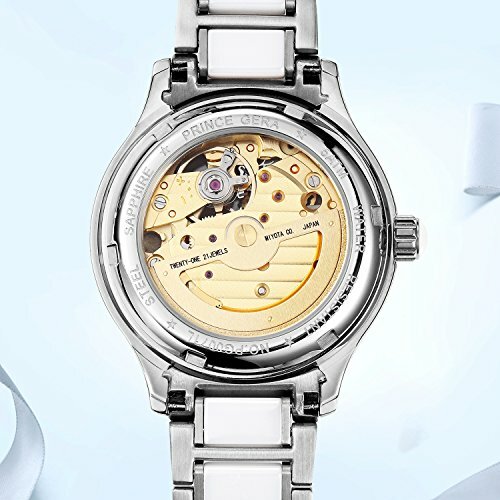 Self Wind; The Frequency of the Balance Wheel is 21600, Power Reserve as Long as 36 Hours. 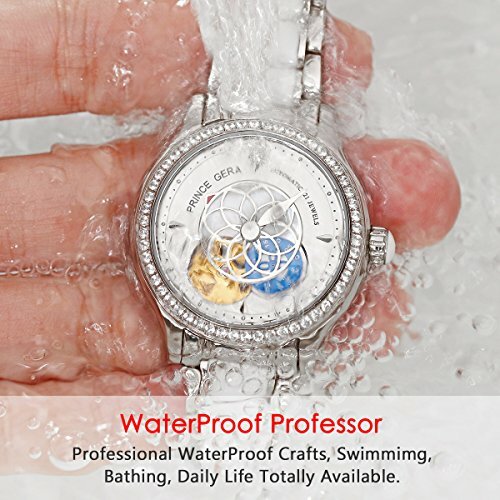 5 ATM(50 M) Water Resistant, Suitable for Splash, Rain, Cold Shower, Washing Car. 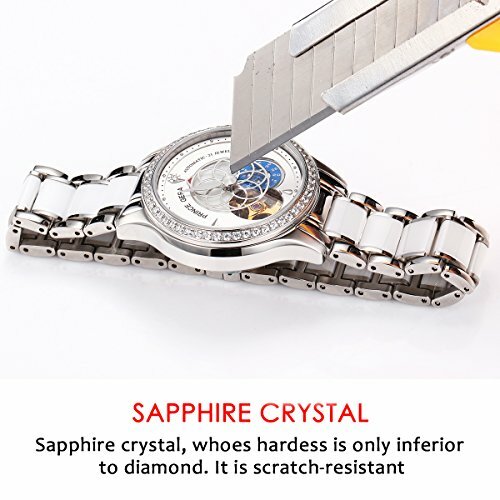 Synthetic Sapphire Crystal, Wear resistance and Scratch Resistant. 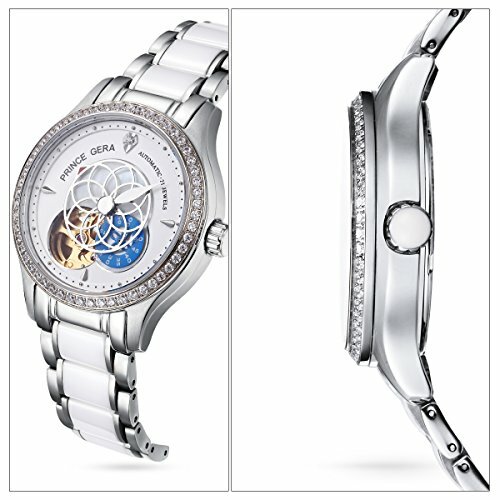 Stainless Steel and White Ceramic Band, Luxury and Elegant Diamonds Bezel; Deployment Push Button Clasp with Buckle. 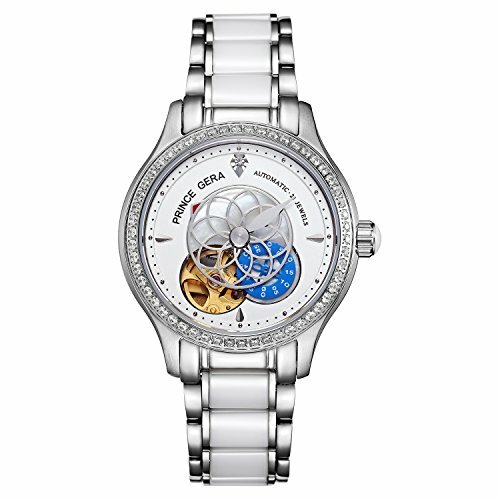 Tourbillon Design, Unique Lotus Hour Hand, Small second Sub-dial, elegant and casual watch for ladies. 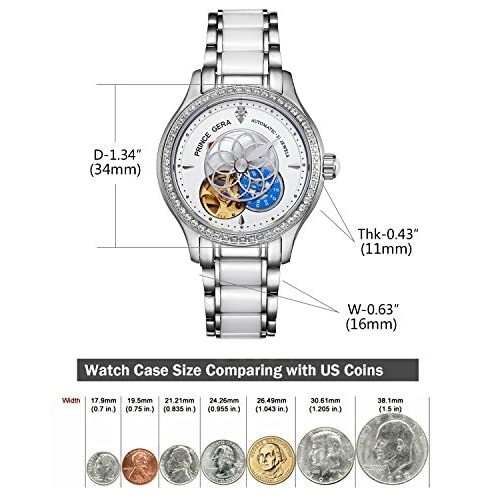 Size Specification, Case Thickness: 11 mm(0.43 inch); Case Diameter: 34 mm(1.34 inch); Band Width: 16 mm(0.63 inch). 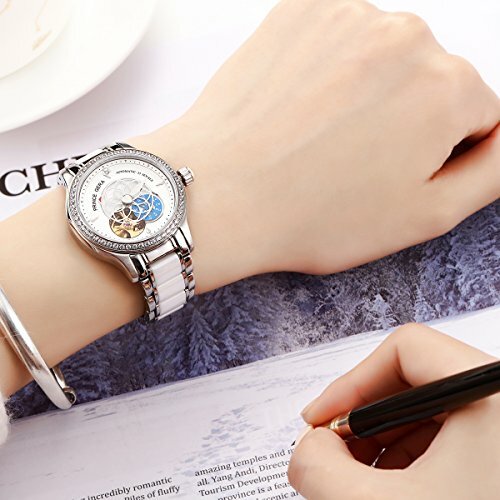 PRINCE GERA is a fashion and causal watch brand. We dare to think and act, pursue dreams bravely. On the journey of dream, release out our own personality, fashionable and taste. -- 50 meters(164 ft) - 5 ATM Water resistance. -- Sapphire Crystal, Scratch Resistance and Wear proof. -- 21 Jewels Japanese Imported Movement. -- 316L Stainless Steel Material, 18K gold Plated. -- Diamonds Bezel, Ceramic Bands. -- Tourbillon design. Unique lotus hour hand. -- Case thickness: 11 millimeters. -- Band width: 16 millimeters. -- Case diameter: 34 millimeters.